Everest College Phoenix-Online makes career education convenient and accessible. Our courses are tailored for working students and others who need a more flexible class schedule. Everest College Phoenix-Online allows you to learn from home and offers the same well-respected curriculum available at our traditional campuses. Advantages to earning your degree online. Traditional daytime universities are not always an option for today's busy students. Online learning makes it possible to balance school, work and family responsibilities. At Everest College Phoenix-Online, we understand that life doesn't stop just because you've decided to go to school. With the ease and convenience of online learning, you'll be able to continue your course of study, even when life throws unexpected surprises your way. Because our classes are flexible, you can continue to work full-time while going to school. And even though you complete your course work on your own time, you won't be doing it alone. Our online classroom encourages participation, interaction, and teamwork from all students. Online courses do require some extra initiative from students. To succeed, you need to develop the ability to be organized, motivated and self-directed. As you do so, you'll polish these and other skills that are essential in today's job market. As an Everest College Phoenix-Online student, you'll have our support from your first day of enrollment through your entrance into the workforce. Why? Because we want to see you succeed in your education AND in your career. We believe that a top-notch educational experience, with personalized attention and support, can contribute to the overall success of your future. Employment assistance for students and grads. Career Planning and Career Testing: We give students and graduates valuable links to career-planning and career-testing Web sites. We also share access to nationwide salary ranges, job titles and descriptions, occupational outlook, statistical projections and more. Career Search: Our commitment to your success extends beyond graduation. Our Career Services experts offer job-placement assistance to graduates. As you start your job hunt, we'll help you with job leads and job search Web sites, valuable industry and company information, helpful networking tips, links to professional associations' Web sites and more. Résumés and Cover Letters: To help you market yourself, your skills and your new degree, we provide personalized résumé assistance to students and alumni. You'll have access to résumé templates and guidelines, cover-letter templates, formatting ideas and more. Interviewing Techniques: Do job interviews terrify you? Our tips on dress code, handshake, posture, communication and follow-up can ease your mind and increase your confidence. We'll also give you an interview checklist that will serve you well throughout your career. References: It can be difficult to decide who to include on a reference list. But at Everest College Phoenix-Online, we make it a little easier. We'll give you a reference form template and show you how to select the right personal and professional references. Salary Negotiations: Salary negotiations are often the most intimidating part of the hiring process. We'll also provide links to salary surveys and geographical/relocation Web sites. Everest College Phoenix is accredited by The Higher Learning Commission, a commission of the North Central Association of Colleges and Schools, 30 North LaSalle Street, Suite 2400, Chicago, IL, 60602-2504; (312) 263-7462. http://www.ncahigherlearningcommission.org/. All programs are approved for the training of veterans. The campus is also licensed by the Arizona State Board for Private Postsecondary Education, 1400 West Washington, Room 260, Phoenix, Arizona 85007, (602) 542-5709, fax (602) 542-1253. The Paralegal** program is approved by the American Bar Association, Standing Committee on Legal Assistants, 321 N. Clark Street, Chicago, Illinois 60610, 800-285-2221. 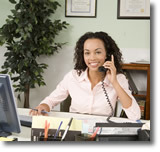 ** Paralegals may not provide legal services directly to the public, except as permitted by law. The Phoenix and Mesa campuses are the only Everest College campuses offering an ABA Approved Paralegal Program. Online. You can participate in your classes any time, day or night. To complete your degree at Everest College Phoenix - Online, you need regular access to a personal computer with an Internet connection. There are many financial assistance programs available for those who qualify, including grants, loans, work-study programs and more.